North Star House Docents tell our story to the visiting public. We are the voice of the Foote Family, Julia Morgan and the North Star Historic Conservancy. 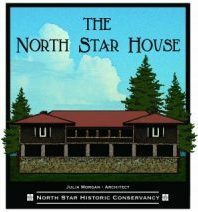 The North Star House docents are trained volunteers who act as a knowledgeable visitors’ guide to further the public understanding of the North Star Historic Conservancy, the Julia Morgan designed North Star House and the surrounding property. Docents greet visitors and provide an informal tour of the house answering questions about the house, the Foote family and the North Star Historic Conservancy. They serve a 3 hour Saturday morning shift once a month from April through October. Docents also have the opportunity to volunteer for NSHC events and specially arranged tours of the house. We are a friendly group who have several social events during the year. Please contact us if you would like to find out more about this volunteer opportunity. If you love history and architecture, this is a job for you. The vision of transforming the North Star House into a cultural event center and museum open to the community is now a reality. The North Star Historic Conservancy is pleased to announce that the North Star House is now open to the public every Tuesday and Thursday from 10am – 1 pm, and the first Saturday of the month May through October, from 9am until noon. We are looking for volunteers interested in assisting with property improvement projects on the 14-acre North Star House grounds. If you have experience with general construction methods such as basic carpentry, concrete work, irrigation systems, building maintenance, or general site improvements we could use your help. Please contact us at thenorthstarhouse@gmail.com or 530-477-7126. The NSHC presents a series of educational events every year. As we make plans for our 2019 Educational Series, we are looking for people interested in lending a hand with coordinating presentations. This may include setup, submitting publicity to media outlets, greeting attendees, and generally ensuring the event goes smoothly. Please contact Event Chair Betzi Hart for more information at thenorthstarhouse@gmail.com or 530-477-7126.